This week I have been pushing myself out of my comfort zone. As I mentioned in my last post, I purchased a package of classes at a local cycle studio and signed up to take a few classes this week. On Tuesday, I took a cycle class. I used to take cycling classes at my old gym with my mom and my sister and I absolutely loved them. When I moved, I never wanted to go to a new gym and take a class by myself. The thought of being in a new place where I knew no one was scary to me. It’s nice to have someone you know with you, especially when you’re attending a class for the first time. Well, I finally went by myself and I honestly had an amazing time. The instructor was great and the other women in the class were really friendly. The class was really difficult (cycling is a great workout! ), but I pushed myself hard and was able to complete the class feeling great. Yesterday I took a Fusion class, which is 75 minutes of cycling, barre, TRX, and free weights. Again, it was super challenging, but I am proud of myself for going and I can honestly say I got over my fear of going to new classes on my own. I will definitely be continuing to incorporate some group fitness classes into my regular routine. It’s also a great way to meet people with similar interests—I have found that when I go to classes alone I talk to the other women a lot more and don’t just cling to the person I came with like I would if I would go with a friend. If you have never taken a class by yourself before- I would encourage you to try it! In addition to my group fitness classes, I have also been keeping up with my Tone It Up Workouts. After pushing myself hard in all of my workouts this week, I know I need to replenish my body with something truly nourishing. I ordered some more Perfect Fit protein from the Tone It Up website while it was on sale- 2 large canisters of Vanilla and 1 small canister of the limited edition Coconut flavor. I saw some really beautiful fresh mangoes at the grocery store and decided to make a tropical smoothie bowl utilizing the mangoes and Coconut PerfectFit. I blended the PerfectFit with frozen banana, frozen mango, and unsweetened almond milk. Then I topped the smoothie with fresh mango, fresh pineapple, flaked coconut, chia seeds, and hemp seeds. It was really delicious and perfect for summer! Try it for breakfast or as a recovery snack post-workout. If you can’t find coconut protein powder, feel free to use vanilla! I’m sure it would be just as delicious! If you make it- let me know how you like it! NOTE: The recipe serves 2, but feel free to halve it! NOTE 2: As always, make sure to keep some bananas in your freezer at all times. They make smoothies extra creamy and thick. Combine all smoothie ingredients in a high-powered blender and process until smooth and creamy. 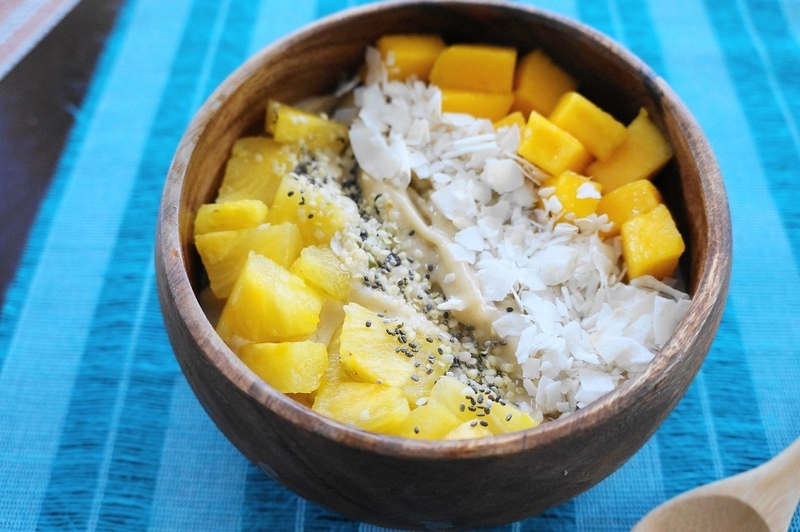 Pour into a bowl and top with mango, pineapple, flaked coconut, chia seeds & hemp seeds. NOTE: You can also just drink the smoothie (sans toppings) if you don’t want to make a bowl. You may need to add additional almond milk to make it thin enough to drink. Looks SOO refreshing, girl! I am in love with mango. And, I’m seriously impressed by your cycling skills. That is one workout I just can’t get myself to do! 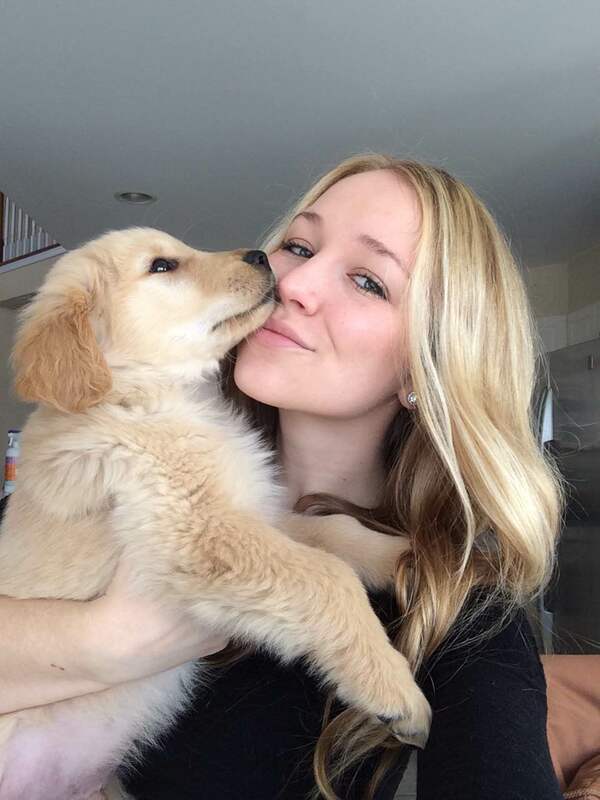 Thanks Allie! Cycling can be so challenging, but it’s the best workout!